This article is going to tackle the solutions and treatments that need to be present in men’s skin care routine besides their shaving practices. Without some quality men’s facial products like cleansers, acne treatments, and moisturizers, people risk developing severe health issues at the level of their facial skin. As long as they incorporate a number of skin care steps into their lifestyle, men can escape the damages of shaving, pollution, and outdoor activities. But first, we will discuss several things to keep in mind while you are shopping for your skin care products. These are some quick pointers to help you pick out the right product for your needs and skin type. Afterward, we’ll get directly to our main point of interest: 5 of the best facial products for men. Let’s begin! It is pretty important to know what type of skin you have. After all, this post is about the best men’s facial products. Learning your skin type will point you in the right direction when it comes to finding the right product. First off, every man requires a certain amount of oil to keep his skin healthy. This is a tricky step for men with large visible pores. Produce can actually build up a somewhat oily, greasy shine on their skin shortly after taking a shower. Men who have oily skin should invest in some products that keep oily skin in check without it making their faces too dry. You know when your skin gets flaky, tight, and itchy? That is dry skin and it is easily taken care of by using a facial scrub that has moisturizing traits to it. Do you notice that your face gets red and irritated after you wash it? This is because you have sensitive skin and you should look for products that have soothing components to it. Is your skin dry in some spots but oily in others? If you said yes, then you have what is known as combination skin. Make sure that you get a product that gets rid of dirt and oil but does not take away the natural oils in your skin. Another thing that you want to keep an eye out for when shopping for the best men’s facial products is the ingredients in the product. When you are shopping for a face wash, some important ingredients to check are olive oil, coconut oil, aloe, and salicylic acid (a moisturizing and exfoliating agent). Moisturizers are really good for removing dead skin cells and clearing up any dry skin. Some key ingredients include Retinol. This removes pore clogging dead skin cells by acting as an exfoliating agent. A lot of fruit have what is called Alpha Hydroxy Acids which clear away dead cells. Even antioxidants like vitamins A and C are all good to have in a moisturizer. Acne washes have two pretty important ingredients, salicylic acid and benzoyl peroxide, among others. The peroxide will remove the dead skin cells and surplus oil while it also destroys bacteria that start acne. There are a lot of other things to consider and look for when buying facial skin care products. Now that you are aware of the basics of skin care for men, let’s find out which are the best men’s facial products you can find on the market right now. Sure, you can use just a regular bar of soap and it will remove the grime from the day. However, a random choice has no remorse removing all the natural oils while also drying out your skin. One of the best men’s facial products, Brickell’s face wash is one of the best because it uses charcoal. Charcoal is good for getting a deep soothing cleanse of your pores without the irritation and dryness you would get from a regular bar of soap. Toxins will also stick to the charcoal, making it even more beneficial. The solution is based on charcoal that is renowned for its properties that clean large pores. Eliminates unnecessary oils and bacteria. Doesn’t make a lot of lather. Who is it best recommended for?This solution addresses to men with dry, sensitive or normal skin. First, the difference between a cleanser and a wash is that a wash is similar to soap in that it creates a lather and needs to be rinsed off. On the other hand, a cleanser does not lather up and you can leave it on your face. Cleansers are good if you work outside or where a lot of dirt and air pollution comes in contact with your skin. Onto the Jack Black bottle, it is a 2-part cleanser that will go deep and clean the skin. The second benefit is that it will not dry out your skin. It is designed to leave your skin with just the right amount of moisture. It is recommended for you to use this lotion both in the morning and before bed. Both a cleanser and a toner. Protects your facial skin from outdoor elements and polluted local environment. Contains sulfate-free surfactants based on oats and coconut extracts. Preps your skin for smooth shaving. You might need moisturizer as it dries out some types of skin. A bit expensive compared to other similar products. 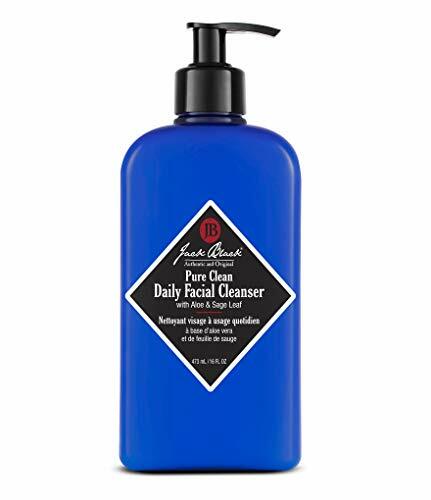 Who is it best recommended for?Thanks to its natural, sulfate-free ingredients, the Jack Black cleanser can satisfy clients with extremely sensitive skin. A good choice for all skin types, Rugged and Dapper manufacturer uses all natural compounds instead of chemicals. It really does deliver in that it moisturizes (obviously), and also guards your face against irritation from shaving while helping eradicate the symptoms of aging (only the ones that are in your skin). On top of that, it also shields your face from harsh weather conditions like wind and excess sun. It is even lightweight on your face and does not have that nasty greasy feel to it. Provides solutions for a variety of issues many men face: aging, acne, environmental damage, shaving irritations. Does not leave any shiny layer once it’s cleaned off. Does not leave behind any scent, which appeals to persons who are picky about their daily mix of fragrances. Some users reported a sticky texture. Some models didn’t have a well-functioning pump. 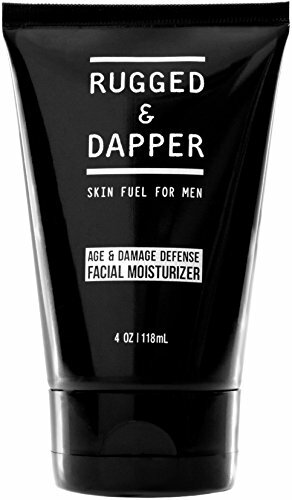 Who is it best recommended for?Rugged and Dapper claims that their product caters to the needs of all ages and skin types. This is some really potent stuff that can get men rid of a facial skin issue as old as time: acne. You definitely should not use this if you have sensitive skin. On the other hand, it can be a really good idea to have something this strong in your kit. This Humane product is different from other acne treatments because it goes deep into your pores and just obliterates acne- causing bacteria. On top of that, it helps heal up acne scars and keep skin smooth and healthy. Also worth mentioning is that it is also great to use on your whole body and not just your face. 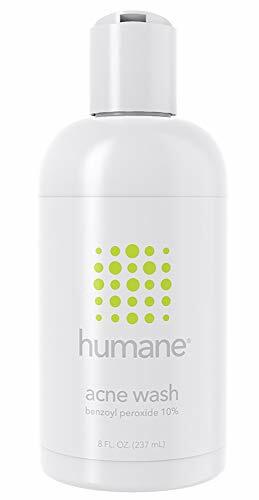 In a nutshell, Humane proposes a great all around acne treatment that actually does the advertised job. The best men’s facial products if you ask Best Shaving Reviews editors. Natural ingredients: aloe vera, shea, jojoba, hyaluronic acid as well as vitamins and antioxidants. Cleanses and moisturizes not only the face but the rest of the body as well. One of the most popular solutions for acne. Some users complained about the bottle that lacks a quality dispenser. Who is it best recommended for?All men who are struggling with harsh face eruptions should consider this product. It is of utmost importance to exfoliate your skin thoroughly. This means to remove the dead skin cells that may trap dirt and clog pores. This is precisely what the Kyoku for Men Exfoliating Facial Scrub will do. It is powerful enough to abolish dead skin cells whilst saving your skin from irritation. Kyoku uses a few different ingredients to achieve this: rice bran, volcanic ash, and Japanese adzuki bean powder. The volcanic ash will clear away any dirt and oils from your face and it will not leave your skin feeling grainy. By far, the Japanese adzuki bean powder is the strength behind the punch. It will get rid of dead skin cells and at the same time it also moisturizes. At the same time, the rice bran helps to smooth out your face, and keep it in good condition for prolonged time. Efficient at eliminating all dead cells. Rich in vitamins A and E for a balanced skin PH. Helps at keeping pores of small sizes. Fights against unsightly blemishes and skin irritations. While the cream is effective, male reviewers weren’t satisfied with the small scrubbing particles. Who is it best recommended for? The brand promotes this product for all types of skin. However, those with severe problems at the level of the facial skin should seek more powerful treatments. So there you have it, the best men’s facial products. It really isn’t all that hard to take care of your skin when you really think about it. Just know what to look for in the best men’s facial products and you’re bound to find the right one for you.